Mildred Gertrude Holtsclaw, 97, of Pullman, passed away Saturday, February 2, 2019 at the Bronson Methodist Hospital in Kalamazoo. 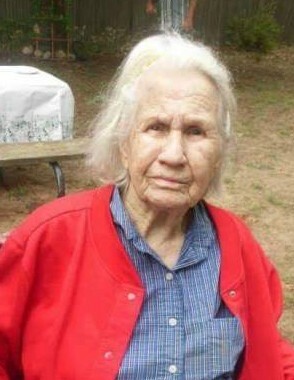 She was born December 28, 1921 to Lorenze Forrest and Bessie Carolyn (Bailey) Huddleston in Mt. Home, Arkansas. Mildred was a home maker with her focus on her family. She enjoyed doing crossword puzzles and enjoyed watching Animal Planet and Wrestling on TV. She also cherished her time reading her Bible. In her younger years, Mildred enjoyed raising her flower and vegetable gardens. She is preceded in death along with her parents by her husband – Claude Cecil Holtsclaw, three sons – Jimmy, Cecil, Jr., and Wayne Theo Holtsclaw, siblings – Raye, Mattie belle, Anthony D., James Virgil, Jewel (Theo), Imogean (Imar) and Hazel Huddleston, and grandchildren – Mack Gentry and Joseph Fitsgerald. Mildred is survived by her sister – Murtyle Huddleston Duty of Holland, children – Carolyn Holtsclaw, Rose Gentry, and Thomas Holtsclaw, grandchildren – Gina Vernon, Robin Martin, Amanda Gonzalez, Kenneth Gentry, Richard Vernon, Jerry Vernon, Stacy Gentry, Bessie Gentry, Kelly Fitzgerald, Donna Ranson, Rhonda Raymond, Katina Andrews, Chelly (Mickey) Ann, Danny Holtsclaw, Darrien Holtsclaw, Chris Holtsclaw, Brian Holtsclaw, Stanley Holtsclaw, Barbara Holtsclaw, and Angeal Dawn McKelvey. Visitation will be held from 12:00 P.M. to 1:00 P.M. at the Filbrandt Family Funeral Home in South Haven. Memorial services will follow memorial services at 1:00 P.M. with Pastor Eric Jarvis officiating at the funeral home. Mildred will be laid to rest at the Douglas Cemetery in Douglas, Michigan.